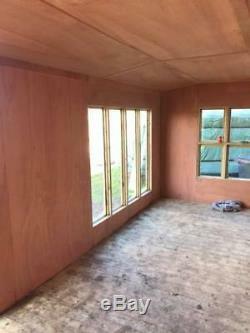 Welcome to AR Timber products, your specialist manufacturers of handmade bespoke timber buildings, produced from the finest grade red wood pressure treated tanalised timber. Our range of timber buildings can be tailored to meet any specification and add something special to your garden space. We create all of our buildings from order so can cater for any size and specification. Pressure treated tanalised 19mm tongue and groove cladding (Walls). Tanalised 63mm x 38mm CLS framework. Tanalised 63mm x 38mm CLS roof and floor bearers. 5ft 8 to the eaves (extra height can be added at an additional cost). 7ft to the top of the apex/pent. 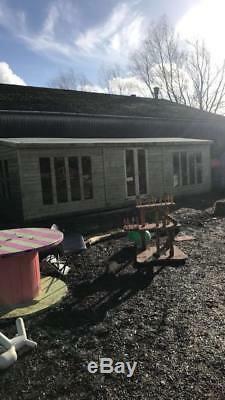 Unlimited fixed standard windows (24 x 18). 40kg polyester lined roof felt. Fascias to prevent wind damage. Some of our most popular optional extras are as follows. Extra height (6 inch increments). Toughened / double glazing window units. More / less / no windows. Our buildings are hand crafted and bespoke to each customers individual preferences and specification. Our timber building range are constructed using only the highest quality tanalised redwood timber that offers long term protection. Good clear access to your buildings base. 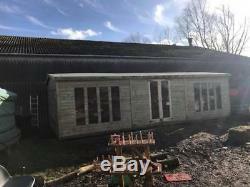 The item "30 x 10 19mm t&g, studio, shed, workshop, garden room, any size, bespoke buildings" is in sale since Sunday, February 04, 2018. This item is in the category "Garden & Patio\Garden Structures & Shade\Garden Sheds". 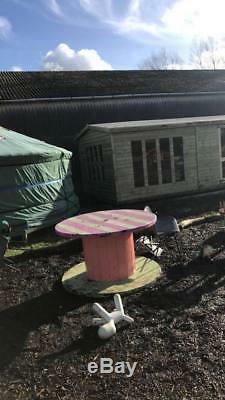 The seller is "artimber" and is located in Stourport-on-Severn. This item can be shipped to United Kingdom.